To update the Named WOD database the app uses, you'll need to go to the Named WOD screen and click on the circular arrows. 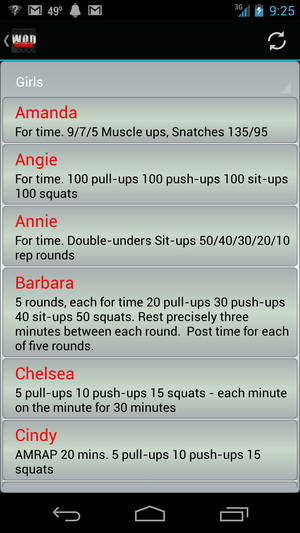 This will reach out to the website and pull down a small file that contains all of the CrossFit named WODs. When the download is complete, and the database has been updated, you'll get a notification. When you click on the notification, the Named WOD screen will refresh. This page was last modified on 15 February 2013, at 09:17.